Tired of historical amnesia so rampant in today's society? You can make a difference by helping kids, educating interesting people from throughout the world and promoting our region's fascinating past! Our Volunteer Tour Guides (Docents) help school students and general visitors understand and appreciate the rich history of Fort Niagara and the Niagara Region. Tour Guide Training is April 27-28. Contact Erika Schrader at (716) 745-7611 ext. 221. 1. To Interpret Old Fort Niagara to visitors in accordance with interpretive program policies. 2. To demonstrate the daily lives of the people who lived in and around Fort Niagara in the 18th and 19th centuries. 3. To understand the safe use of all tools, firearms, ammunition, watercraft, and fire management. 4. To maintain all issued clothing and equipment, and wear issued clothing and equipment in accordance with costume rules. 5. To be available to conduct guided tours as needed. 6. To assist with maintenance and cleaning of the fort. 7. To complete assigned schedules, or take responsibility for schedule revisions with clearance from interpretive management. 8. To learn and master the skills required to portray an 18th/19th century person. 9. To convincingly portray one of the following 18th/19th century persons. 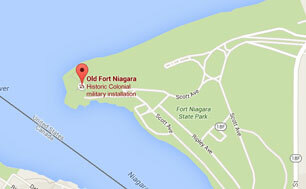 - Must have reliable transportation to and from work at Old Fort Niagara. - Must be able to lift 50 lbs. - Must be able to work in extreme weather conditions in heavy clothing. - Must possess good communication skills, and ability to work as part of a team. - Ability to comprehend and follow oral and written instructions. - Must be able to move over uneven surfaces in historic structures.